It’s something Brett Cortright likes to say, but it might as well be the marketing slogan for Grand Canyon University’s new Bachelor of Science degree in Hospitality Management, scheduled to be launched this fall in the Colangelo College of Business. 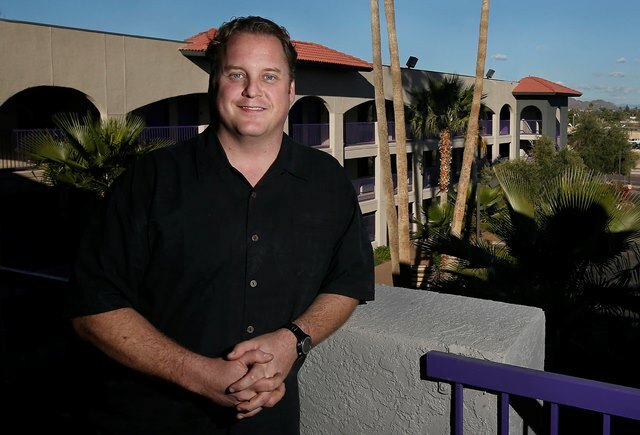 As general manager of what will be GCU’s new resort at Interstate 17 and Camelback Road, Cortright will set the tone for students who want to learn about the industry from a contagiously enthusiastic guy who has been trained by the best. Brett Cortright is working to prepare the refurbished Grand Canyon University Hotel in time for students to work there in the fall semester. Last August, GCU purchased the 152-room Quality Inn and Suites with the idea of making it a purple jewel that shines for passing motorists to see and provides a centrally located resort option for visitors. The plan is for the Grand Canyon University Hotel eventually to include the completely refurbished hotel and a new lobby, 1,000-seat conference center, 200-seat restaurant and resort-style pool area, all of it accessible from a new entrance on 27th Avenue. The freeway side of the hotel will be protected by a sound wall. Not only will it be a destination for GCU visitors, weddings, conferences, concerts and community events, it will be a teaching laboratory for students. They will be required to complete 600 hours in the service industry and handle the jobs of food and beverage director and director of rooms, in addition to about half of the lesser roles. “There will be a whole semester of understanding what it’s like to be an exec,” Cortright said. General business studies will be combined with courses in hotel and restaurant management, revenue generation, hospitality marketing, and food and beverage. “The idea is to give our students a business-based view of the hospitality industry and apply these principles in the workplace,” said Dr. Randy Gibb, CCOB’s dean. Also under the hospitality banner, the University is launching degree programs in tennis and golf course management. Click here to read a GCU Today story about them. GCU President/CEO Brian Mueller’s advice — “The hotel must mirror the warmth of the University” — hit home with Cortright, but it’s not as if that part is a challenge for an industry veteran who has built his career on friendly service. He came up through the ranks with The Ritz-Carlton, which he calls “kind of old school, by design, but very progressive in their marketing strategies and their ideals.” The minute “The Ritz” comes up in the conversation, Cortright’s natural enthusiasm goes from supersonic to off the charts. Cortright was general manager of an Aspen, Colo., restaurant chain when he attended a Ritz-Carlton leadership summit, and he was so impressed he resigned and became an assistant food and beverage manager at The Ritz-Carlton — a big step down. “The executive chef was doing the hiring, and he asked why. I just said because of the training. I said I want to own a restaurant someday, and I want to be trained by the best,” Cortright said. Cortright was born in Phoenix and went to Cactus High School in Glendale. His family’s Ukrainian roots are evident in more than just the pierogi (dumplings that are stuffed with various goodies, then boiled) his aunt taught him to make. 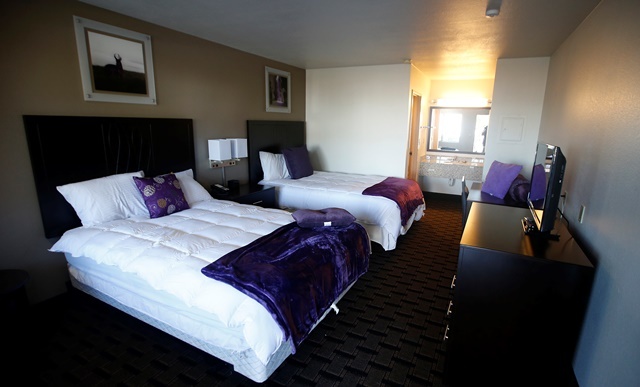 The newly decorated rooms at the Grand Canyon University Hotel have plenty of purple (of course!) accents. The first 20 rooms of the GCU Hotel were done in time for the Chicago State University men’s basketball team to stay there when it played the Lopes the weekend the Super Bowl was in Glendale, thereby saving the visitors thousands of dollars they would have had to pay for inflated room rates elsewhere. Cortright took delight in showing off some of the neat little touches (besides lots of purple) in the rooms, from old-fashioned alarm clocks to striped pillowcases. Cortright’s experience and skill set fits well with the inevitable turnover that will come with having students shuttle in and out of the program. And that restaurant he plans to own one day? The featured item will be pierogi, of course. “It’s probably not something I’ll put on every corner in America with the golden arches, but it’s something that I think the world deserves,” he said. You can be certain he won’t be a grumpy pierogi guy, either.